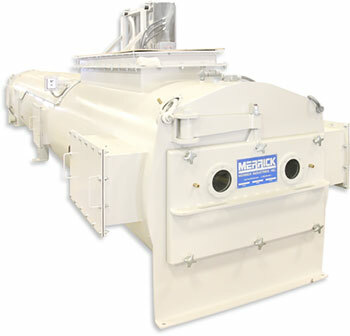 The Model 490 NFPA rated gravimetric feeder is designed to meet your needs when feeding a fluidized bed boiler or other system needs requiring a low pressure, sealed feeder. It is designed with the operator in mind to give years of trouble free operation. Safety – Safety is always the top priority at Merrick. The model 490 is tested to 3 psi, according to NFPA 85 criteria. The model 490 utilizes Merrick’s signature low-tension belt weighing philosophy that most efficiently reduces the harmful effects of belt reaction error. As a result, Merrick feeders offer the most cost-effective method in providing the highest accuracy available. Other belt feeders feature a high tension belt system, which can only delivery acceptable accuracy by including expensive, precision tolerance components and costly machining to “tune” each individual weigh system. Such tight tolerances cannot be maintained outside of the factory due to the wear associated with the harsh coal feeding environment. Adversely affecting accuracy, a high-tension belt magnifies any mis-alignments due to slightly offset tolerances or eventual wear. In addition, a high-tension approach requires greater horsepower, while significantly increasing wear on all rotating parts. A unique infeed design also aids in accuracy and durability. The infeed of the model 490 is contoured to allow coal to follow its natural angle of repose as it is deposited onto the belt. This natural transition from vertical flow to horizontal flow minimizes belt tension variations and provides a uniform load profile, allowing a lower belt tension and increased weigh accuracy. A slotted infeed design is also available for feeding difficult to handle coals or limestone.